(NaturalHealth365) We very often hear that we should be drinking more water to be healthy. Whether or not the general recommendation of 8-10 glasses of water is what you’re getting, you know you need water to survive. So, obviously, the better the quality of water you drink – the greater the chances you will be hydrated and stay healthy. But did you know the inverse is also true? Poor quality water, laden with chemicals, drugs, pathogens, and other contaminants can hurt you more than you think. And, sadly, this is rarely discussed on mainstream media outlets or within most conventional ‘healthcare’ facilities. Important question: What’s in your tap water? Sometimes, drugs get thrown away or flushed down the toilet by people who aren’t taking them, and they go through the usual drainage system. On top of that, there are drug residues that people excrete that get into the water the same way. Unfortunately, the distribution plants aren’t equipped with the kind of microfiltration that would eliminate these drugs and residues from, and they remain all the way to your tap – where they’re delivered to each glass of toxic liquid you drink, and through your open pores during each hot shower. Whether or not you are on any prescribed medication, the toxic mix of drugs in the water can cause all kinds of side effects that build up over time. For example, fracking, or fracturing, is the drilling of wells for oil using astronomical amounts of water. This water returns to the water table that towns and cities draw water from, and is often the source of drinking water for the local area. You may have seen videos where residents were able to turn on the tap and literally light their water on fire due to these chemicals and gasses in the water. These chemicals aren’t safe for consumption at any level, so their presence in the drinking water is a clear threat to human health. Unfortunately, there are a whole host of chemicals, byproducts, and pathogens that live in the water that gets delivered to most home. Some of these are present in the water and are simply not filtered out at the ‘treatment’ plant and others live in the pipes that deliver the water to your home. Some examples of this include bacteria and viruses, bleach, pesticides, and even radioactive waste. Water treatment plants even add sterilizing agents to try to reduce bacterial growth that you then ingest. In reality: When you turn on your tap water – that water is far from healthy. But, you do have a much safer, cleaner solution available. The most convenient, though sometimes expensive option is to install a whole house water filtration system. 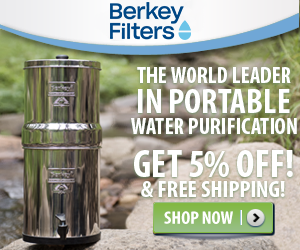 These can be used in nearly every home, and they filter the water as it comes into the house. Depending on the contaminants in your water and the level to which you want your water to be filtered, you can pay a small amount, or a great deal. Some of these types can be installed by the home owner, and others require the services of a plumber. They also will need to have the internal filters replaced periodically. If whole house filtration is too expensive, you can use an ‘end-point filter’ – which can be installed on a sink or showerhead, though these typically do not filter as well as whole house systems. Another option is to subscribe to a water delivery service. Most areas have a couple services to choose from, and they have more specialized filtering that usually translates to much cleaner water than the municipal service – but, that’s no guarantee. If you’re willing to be adventurous, and you’re lucky enough to live near some wilderness or parks, you may have access to a natural spring. Natural springs tend to be a wonderful source of clean, healthy, living water. When water is produced from a spring, there are several highly beneficial things that have happened to it to make it better for you than conventional tap liquid. This water has gone through extensive filtering through many layers of earth and rock, and it began as rain, snow, and melt water. These steps have eliminated contaminants, and the slow natural filtration process means that this is one of the best liquids on Earth. Water that is fully filtered by this extensive process is pushed by the Earth against gravity upwards to the surface, ready to drink. This type of water can never be pumped, it must be allowed to flow at its own pace to keep the purification process intact. About the author: Seth Leaf Pruzansky is the founder of Tourmaline Spring “Sacred Living Water” of Maine. It is the highest quality most ethically produced bottled water in North America. It is an ancient geologic spring so naturally pure that it is officially exempt from all processing requirements-hence it’s status as a “Living Water”. Click here to order Tourmaline Spring water today!